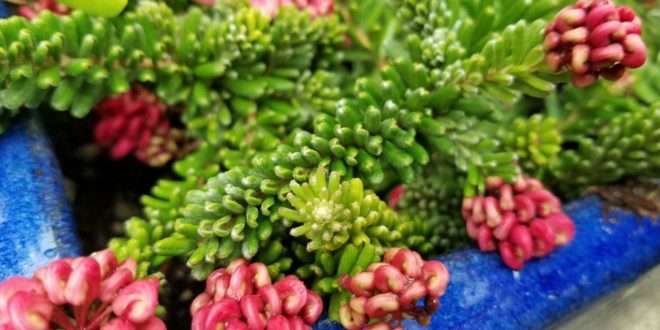 New to our Sunnyvale garden in 2019 is Grevillea lanigera – A low, dense ground cover/shrub to grows to 2 feet tall and 4 feet wide with small, narrow gray-green foliage that is soft and woolly. I have planted ours in a tall container with the hope that the long branches will hang. The cream and pink flower clusters form at the stem tips in winter and spring. The densely-clothed branches are spiral-shaped, resembling Asparagus d. ‘Meyers’. Performs best in full sun to light partial shade in a well-draining, moist to dry soil, surviving short periods of drought. Highly attractive to butterflies. This somewhat tender plant can reliably survive short duration temperatures down to the low 20°s F.
The species has a wide distribution from the northern tablelands north of Sydney in New South Wales south to Wilson’s Promontory in Victoria. The genus is named after Charles Francis Greville (1749-1809), co-founder of London Horticultural Society. The specific epithet “lanigera” comes from the Latin word ‘lana’ (wool) and ‘gerus’ (bearing) referring to woolly leaves.